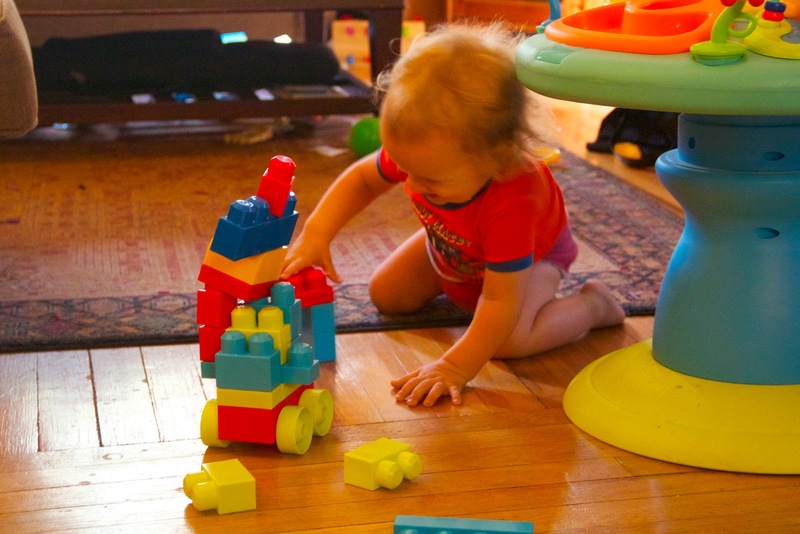 The other day I was watching the munchkin play with his blocks. They weren't fitting together the way he wanted and the little car he was building kept falling over. He was getting really angry. The urge to go over there and help him was overwhelming, but I kept back and let him work on it himself. The blocks caused several tantrums over the next couple of days. He was determined to get it right. If I dared interrupt him because it was bedtime, or he needed his diaper changed... boy did he let me know his displeasure. Then this morning, as I was getting ready to head out to work, I noticed that he was pushing around a giant block car. You have to love his determination. I know that as he grows up it will continue to be a challenge not to jump in to save him from stress, or save him from getting his feelings hurt... but I think that the frustration can lead to great developments. Its my difficult job as a parent to know when he needs me and when to let go and let him figure it out on his own. To see how proud he looked this morning, I think I made the right call. Love this blog Aimee. I remember reading something that said one of the best things you can to is let your child get frustrated with toys and let them learn on their own. It has always stuck with me.